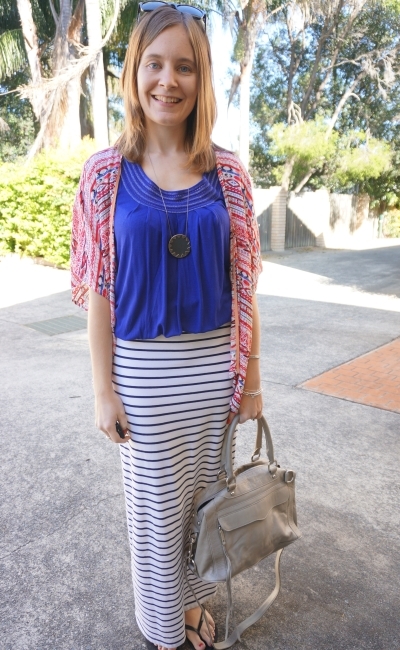 Continuing on with blogging my Frocktober outfits. I'm wearing a different dress each day in October, to raise funds and awareness for Ovarian Cancer Research Foundation. 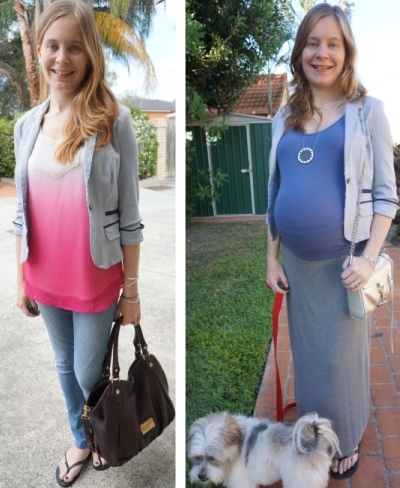 I've been posting everyday on the #Frocktober2015 tag on instagram and I'm just catching up on the blog. As well as setting myself the challenge of wearing a different dress every day in October, there is another style challenge on instagram (#myStyleOctober) I wanted to participate in. This was the first day I could see an outfit working, the prompt was 'belted' so I knew this belted jersey dress would be nice. 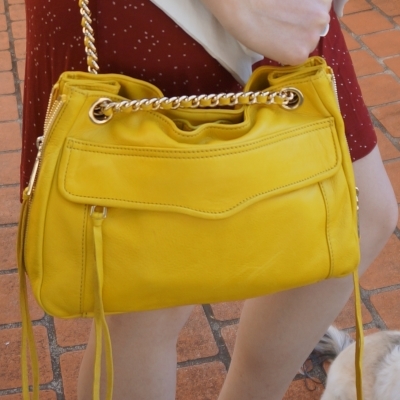 I also finished up participating the #basicscheckin challenge by swapping out my bag from the red Marc by Marc Jacobs Ukita I'd carried the day before, as I thought this yellow one worked better with the dress. 3 challenges in one outfit! It was a nice comfortable outfit for a day out shopping with my mum and sister - we were looking for a dress for a special event my sister had coming up. When I was trying on jackets in the morning I thought this one looked really nice, but I'm a bit underwhelemed with it looking at the photos. Maybe one that was not as 'busy' would have worked better. Last worn: Ray-Ban Wayfarers, white jacket, star print jersey dress, Chelsea ankle boots, Rebecca Minkoff swing bag. 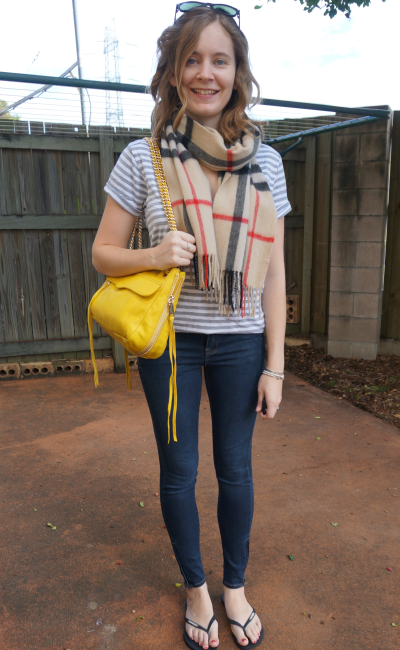 Other ways to wear: white jacket and skinny jeans, star print dress in third trimester, Chelsea ankle boots and jeans, Rebecca Minkoff swing bag and a yellow tank. 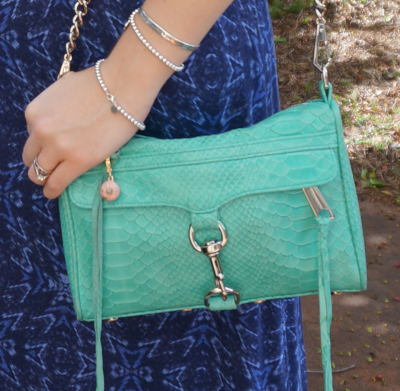 I've worn the bag and dress together before, it's a nice combination of colours. I really liked this outfit. It was perfect for a morning with hubby and toddler T, popping to the library, doing a little bit of grocery shopping and then going out for Sunday lunch as a family. 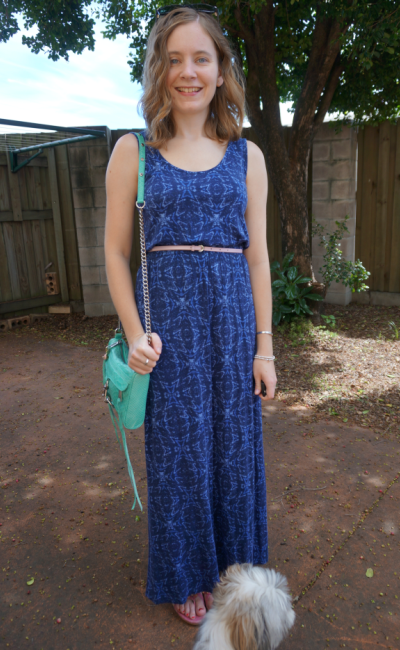 Almost a year ago I mentioned that I was thinking about getting rid of this maxi dress. I've decided to let it go now. It's a lovely dress, but I pick my other maxi dresses over it frequently. It's going to go into our Frocktober fundraising frock swap party at work, so will hopefully be replaced with another pretty dress! 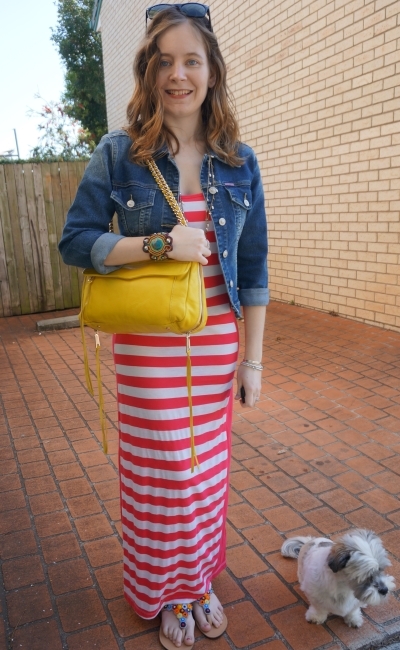 Last worn: Ray-Ban Wayfarers (above), denim jacket, striped maxi dress, Ikwetta sandals, Rebecca Minkoff swing bag (above). Other ways to wear: denim jacket and colour blocking, striped maxi dress for a weekend getaway, Ikwetta sandals for a road trip, Rebecca Minkoff swing bag and flared jeans. 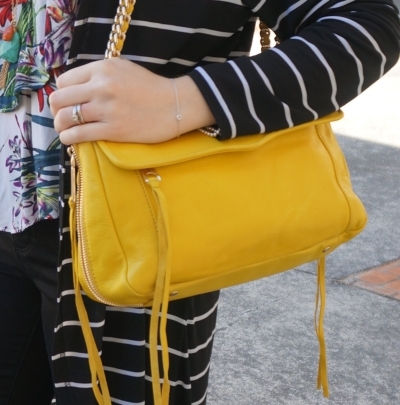 Linking up with Mix It Monday, Modest Monday, Confident Twosday, Style Sessions, On Trend Tuesday, Turning Heads, Wardrobe Wednesday. 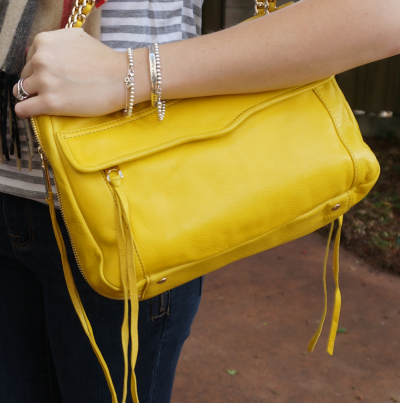 Rebecca Minkoff Bags: Swing and Love. New Hair Cut! Another play date for baby T! It's really fun now the babies are grown up and crawling around, there's a lot more 'playing' involved at our mummy meetups. Wore this casual outfit for a morning at an indoor playground with the ladies and babies from my mother's group. I haven't seen them in a while. It's gotten harder with even more people back at work and getting the days we have off to line up. I've started branching out a little too to join other groups, as now I know what my schedule is like for work I want to make sure that baby T has some activities planned for the days we have together. Converse as you have to wear socks at the playground, and shorts again as they are really quite practical for playing on the ground with baby! I wore this tank because I've been looking at it hanging in my wardrobe for a while and felt it was due a final wear to decide if it stays or goes. I looked on the blog and I've actually worn it 7 times before which is more than I thought I had. 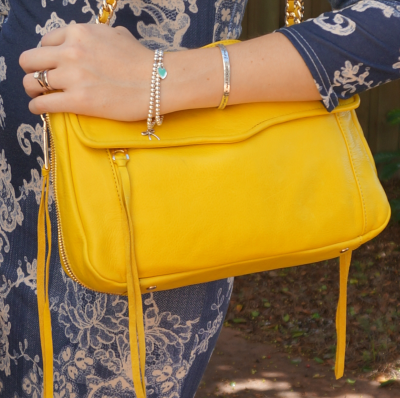 One of the benefits of having a personal style blog, I can always search and see when I last wore something or how much something has been worn. I wasn't really loving it when I wore it, but I wasn't hating it either. It's just a nice top. Nothing special, but nothing I dislike. I am going to hold onto it a little longer and maybe try wearing it to work before I make a final decision if it stays or leaves my wardrobe. 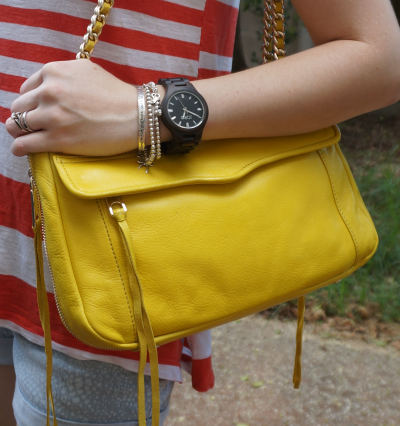 Last worn: Ray-Ban wayfarers, stripe tank, printed shorts, Converse, Rebecca Minkoff Swing bag. This skirt has been worn 7 times too! I absolutely love this skirt. 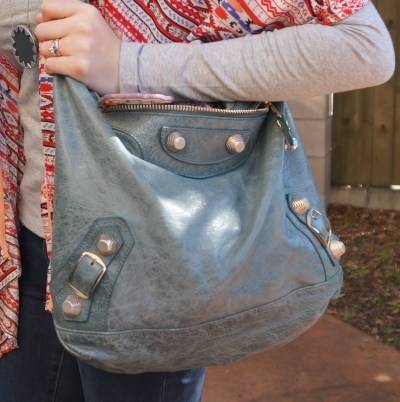 Of all of the $5 sale buys I have in my wardrobe, I think this one is the prettiest! I have about 8 pencil skirts to add to my wardrobe (that I had boxed away when the baby bump outgrew them) so I really need to make room for more skirts. I wore this so I could give it a final wear before I decide if I should keep it or remove it from my wardrobe. I was fairly certain I was going to get rid of it. This skirt is a really beautiful piece so I was looking forward to wearing it one last time, and date night with DH was perfect. Baby T stayed at home with the babysitter and we went out for dinner and a show at QPAC. Although I did wonder at the last minute if I should take a jacket, it was so warm that evening I didn't need one. The cardi I grabbed as we rushed out the door just hung over my bag the whole time. Usually if I am thinking of dressing up for a special occasion, I'd think of a dress rather than a skirt. It was really nice to wear this skirt though. 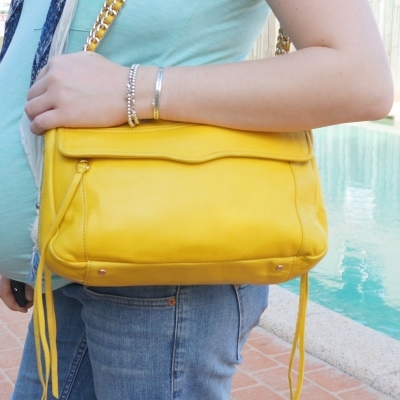 Last time I wore it, it was hiding my little early second trimester baby bump! I know it's impractical at the moment due to the shorter length, and I won't have many chances to wear it while looking after baby...but I really do love it. If I saw it in store today I'd buy it, so it is staying in my wardrobe. Even if I don't know the next time I'll wear it and I really should let it go, it's just too pretty! It's a keeper. Last worn: white cami, lace mini skirt, Asos leather sandals, Rebecca Minkoff Love bag. 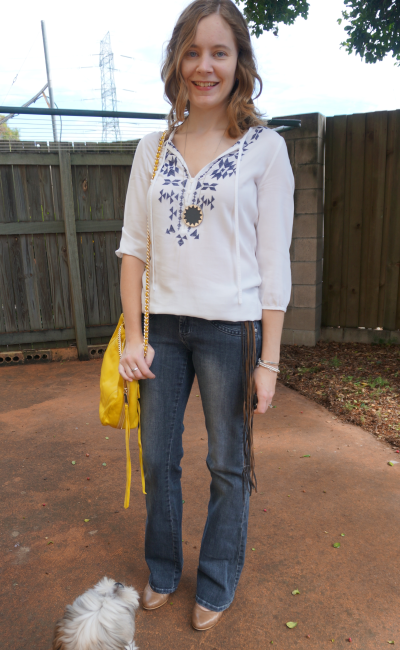 Linking up with Let It Shine, Shoe and Tell, Style to Inspire, Mix It Mondays, More Pieces of Me, Daily Express, Style Sessions, Real Mom Style, Confident Twosday, Wardrobe Wednesday, What I Wore today. I think I'm getting slightly better at taking self timer photos with my old little point and shoot camera after accidentally dropping my usual camera. Two more outfits - but only one was a Fox in Flats DAREcember style challenge outfit, the other was what I wore when I couldn't wear an outfit to meet the challenge that day. The style challenge for the day was "bright" so I wanted to wear a really colourful outfit. 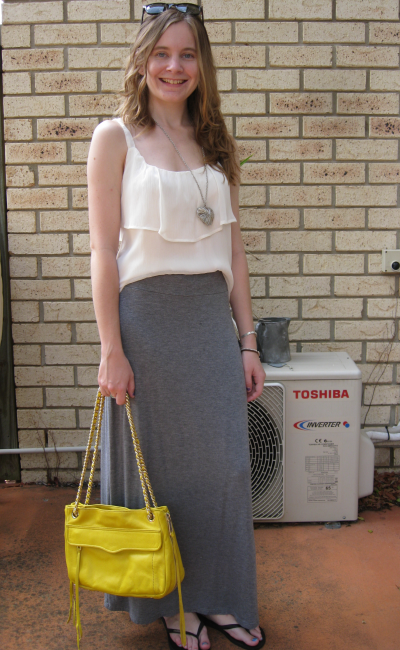 I thought this ombre maxi skirt would be perfect, paired with the yellow tee for even more colour. It would have been nice to have my normal camera and an accurate colour representation, but hopefully I won't be using this little point and shoot and self timer much longer. Sadly, this tee isn't staying in my wardrobe. I don't know if it was because I last wore it when I was in the second trimester, or because baby T loves to grab and pull on things, but this tee has really stretched out. It's definitely not the size small it once was! I won't explain the full embarrassing story, but I ended up sharing more than I wanted to in the doctor's waiting room as baby T pulled on my top. Won't be wearing it again, as much as I love the message on it. I bought it over a year ago from Hendrick Boards, and a portion of that sale went to an animal shelter, so it's good that I can donate it and create more money for another animal shelter when it's sold through the AWLQ. 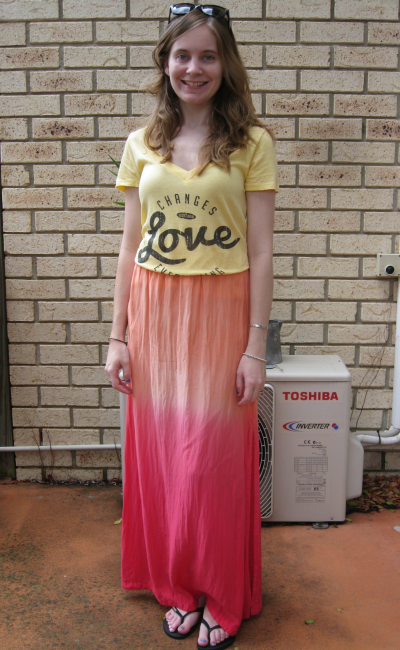 Last worn: Ray-Ban Wayfarers, love changes everything tee, ombre maxi skirt, Havaianas. Wearing my Havaianas again! The style challenge for the day was 'killer heels' but there is no way I could wear them looking after baby T. I did take a pic of them on instagram for the challenge that day though. Flats are much more practical! 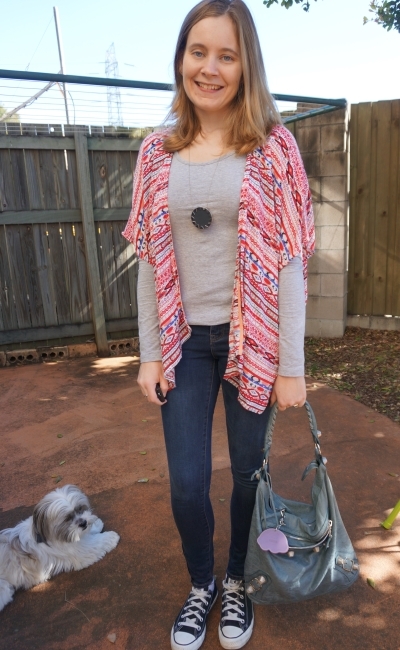 I've had a few comments now and then on the blog that my outfits would look much better with something other than thongs, but I'm a Queenslander...thongs are my shoe of choice most of the time, especially on hot days. I'm not going to wear pretty shoes just to get a pretty picture, I share what I actually wear. As I didn't pick my outfit out based on the style challenge prompt for the day, I just went with what was comfortable. 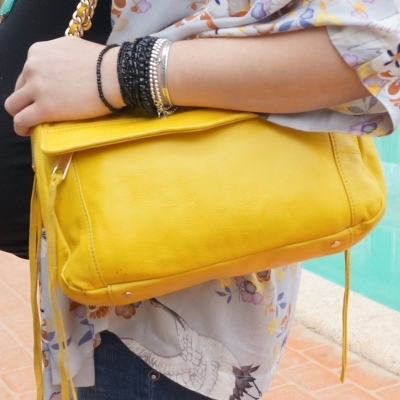 The bright bag would have looked so nice with the previous day's outfit, but I just carried the baby bag then. 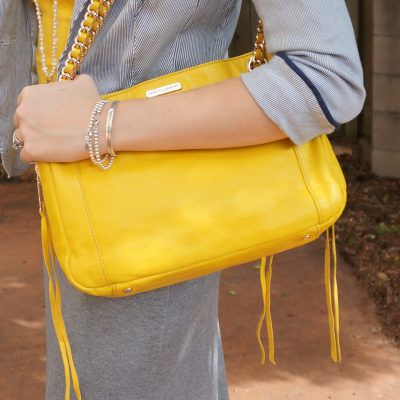 I thought the yellow was nice against the neutral tones. Wore this to spend the day out shopping with my sister and baby T, crossing a few last minute things off our Christmas lists. This year I'd managed to run out of both wrapping paper and sticky tape, so we had to brave the madness that was our local Westfield in December. I try to finish my Christmas shopping before December every year just so I can avoid the stores, it's much too hectic for my liking. 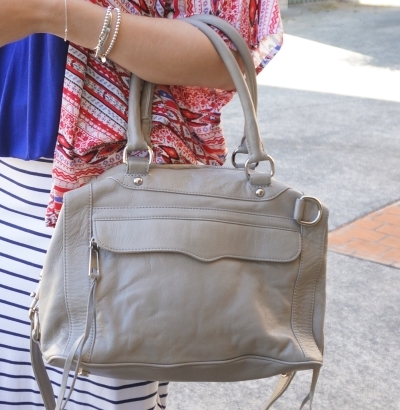 Last worn: Rayban Wayfarers (see above), white ruffle cami, grey maxi skirt, Havaianas (see above), Rebecca Minkoff swing bag. 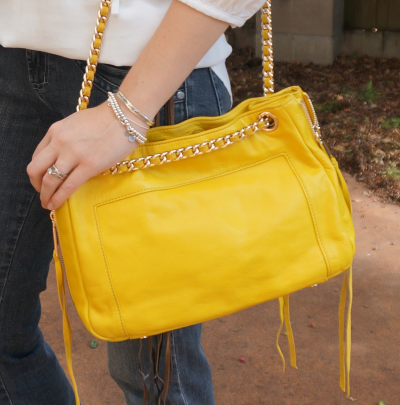 Linking up with Passion For Fashion, Casual Friday, Fab Favourites, Modest Monday, Let It Shine, Style to Inspire today.